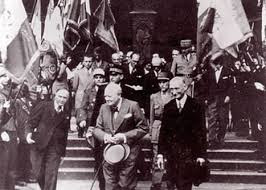 Seventy years ago, on 14 July 1946, Robert Schuman hosted Winston Churchill in Metz to discuss the future of Europe. Later as Prime Minister and Foreign Minister, Schuman initiated the Council of Europe, the European Community, the defensive basis of NATO and the European Payments Union, the core of European monetary stability, as four pillars of the New Europe. Why today are Britain and Brussels at loggerheads? Ignorance of the history of European Democracy is one reason why the Brexit referendum occurred. The Brussels elite also seems to lack a real grasp of democracy. More Member State Exits will happen if the Brussels leadership does not sharpen its act. A recent Spiegel interview with Commission President Jean-Claude Juncker and European Parliament’s Martin Schulz illustrates this well. Here’s an extract. Juncker: I have always considered it to be a minor miracle that after the war, people in Europe’s border regions were able to forget everything and, in accordance with the slogan “Never Again War,” develop a program that still works today. It is always said that Europe is a project of the elite. That’s incorrect. In fact, it was a concern of the soldiers who fought at the front, the concentration camp prisoners and the Trümmerfrauen (Eds. Note: The women in Germany who helped clear away the rubble following World War II). It was they who said, we’re going to do everything differently now. De Gaulle and Adenauer merely acted upon this desire. Does the Brussels elite really consider that De Gaulle was the architect of the European Community? It is hard to believe that anyone who is responsible for the Guardianship of the Treaties could believe that! But then the European Council did create an entirely fraudulent exhibition in Brussels that celebrated the arch-enemy of the Community method as its saint! The founding treaty dates from 9 May 1950 and its signature on 18 April 1951. De Gaulle was not in power. He was away sulking in Colombey-les-deux-Eglises and trying to bring down the democratic governments of Georges Bidault and later prime ministers, under whom Robert Schuman served as Foreign Minister, 1948-53. De Gaulle was sulking because the French Parliament rejected his anti-democratic or autocratic seizure of government. He withdrew from government in January 1946. What was de Gaulle’s policy? He wanted to dismember Germany and make the Rhine France’s border. Saar would become totally French. The industrial Ruhr would be made into a separate State. He wanted to dismantle the Democratic Constitution at Bonn, that Schuman had patiently and wisely created in 1949 to the astonishment of his British and US counterparts, Bevin and Acheson. De Gaulle wanted to use Germans under his generalship as part of his army to oppose the Soviets. (He expelled NATO from Paris and Americans from France.) He later made the Germans pay for the Common Agricultural Policy to bribe French farming voters and create unwanted Meat Mountains and Wine Lakes. Adenauer wrote that Schuman had laid the foundations of European peace. He wrote that while De Gaulle was visiting Germany in 1962. In 1952, thanks to Schuman, Adenauer had been the first president of the Council of Ministers of the European Community. Was it a ‘minor miracle’ that Europe was able to have peace — the longest in 2000 years of history? The visiting Israeli President Shimon Peres told Brussels at least three times in one day that it was a miracle of our age! Apparently the Brussels elite believes there was no leadership for the ex-soldiers and the women (who were paid to clean bricks from bombed out buildings) to create that miracle! It just happened. Contemporary Allied reports, however, highlighted the fact that most German youth were still fanatically Nazi and there was a strong revanchist movement for a further war after reconstruction. So how did the women change matters? Was it due to prisoners returning to Germany? These events could be paralleled with similar events after every other war. Every generation of Europeans repaired the ruins, then planned the next war, and then suffered the consequences. Do the Brussels elite know what was different with what happened after the Second World War? So how did these common people influence de Gaulle — who wasn’t in power — to not make war but make peace? After a decade of heavy Gaullist control of radio, television and other media and propaganda, only an uncritical person would continue to believe it. Only naive people would take de Gaulle for anything but an ultranationalist with a Charlemagne complex. Nigel Farage eat your heart out! In its 43 years of EU membership, Britain has never been able to decide whether it wants to fully or only partially belong to the EU. Schulz: Primary responsibility for Brexit lies with British conservatives, who took an entire continent hostage. First, David Cameron initiated the referendum in order to secure his post. Now, fellow conservatives want to delay the start of exit negotiations until they’ve held a party conference. And regarding detractors: I’m proud of the fact that Ms. Le Pen in France insults me and Mr. Wilders in the Netherlands calls me his opponent. The way I see it is, if these people weren’t attacking me, I would be doing something wrong. SPIEGEL: Criticism isn’t only coming from right-wing populists. Mr. Juncker, the Polish and Czech foreign ministers have called for your resignation. They feel the Commission is too domineering. The UK has always been a fierce defender of Democracy regardless of the costs. Its criticism of the lacks in Brussels have gone unheeded. In 1946 Robert Schuman, then Minister of Finance in a war-torn, corrupt and Communist Party dominated France, and Winston Churchill discussed how the New Europe could arise through spiritual renewal. The Brussels elite seem incapable of discerning truth from falsehood. What chance has Democracy? It might be worthwhile for the Brussels elite to recall the way the European System should be working and the failures of Brussels to follow the articles of the treaties.